Hapalochlaena maculosa is better known as the Australian blue-ringed octopus, and is part of the Family Octopodidae and Class Cephalopoda. The venom of this octopus is discussed in this essay, as even though it is not often as painful as many other local Australian marine life, it is very distressing and biochemically interesting. It has a very well developed brain and a mantle full of visceral organs including its venom apparatus. Its body is only the size of a golf ball, and end to end will grow as big as 20cm, weighing only 38g. Its venom is not painful, but it is deadly in some cases. It is also dangerous because it only dives as low as 20 meters, which means it is often found in tidal pools. Worse still is the fact that it often hides in redundant shells, including laying its eggs in oyster shells. They are not particularly aggressive, but will sting if you restrict its escape route. This is the neurotoxin venom that is produced by salivary glands within the mantle cavity of the octopus. A well fed octopus will inject the venom into the water surrounding the crab and wait until the crab dies. 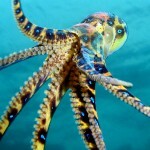 If the octopus is poorly fed then it will inject the venom into the crab whilst clasping on to the crab until it dies. The reason that maculotoxin is of such interest is because nobody has yet collected enough of a pure sample in order to conduct a full investigation as to its composition. Collecting a pure sample from a live or dead Hapalochlaena maculosa is notoriously difficult. Tests have only proved that one or two chemicals are present every time, but the exact composition is still a mystery. Are you looking for an essay on this topic? Our writers will be glad to help by providing you a custom-written paper with your specific requirements.